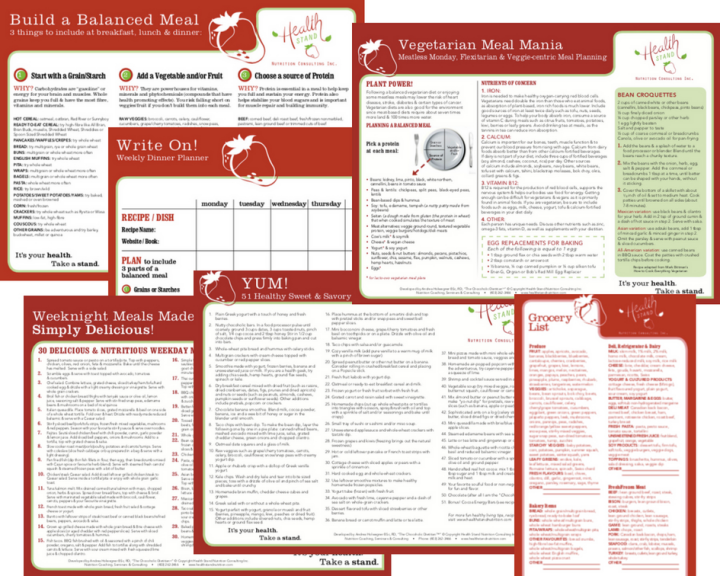 Meal Planning Six Pack – Limited Special | Health Stand Nutrition Consulting Inc.
Make healthy eating easier with our Meal Planning 6 Pack! You will never be short of ideas to create breakfast, lunch and supper meal planning ideas. This list allows you to mix and match healthy foods to create yummy meals at home or on the go in 3 easy steps. The ease and flexibility of this tool is why many of our clients rank this as a favorite resource. ​Our weekly supper planner worksheet is a great way to visualize and plan your supper meals one day at a time or for the week ahead. You won't need to agonize about what to make with this simple supper planner that can be completed in just a few short minutes. ​Get healthier and shop faster! Our grocery shopping list will help you stock your pantry, fridge and freezer with tasty and healthy foods. Having a good list can also help you manage your budget and reduce food waste. ​If you are stuck for a healthy snack idea, our list of 51 ideas is guaranteed to inspire you. Read our top dietitian approved tips for what, when and why healthy snacking is key. We’ve included our award-winning recipe for Cocoa Energy Bars that won’t even require you to turn on the oven! ​Meal planning can be as easy as 1-2-3. This resource offers some key strategies to help you navigate healthy meal planning for time crunched schedules. You will also find 30 ideas for dietitian approved dinners for busy weeknights when time is limited. ​Incorporate more vegetarian, meatless Monday or flexitarian choices in your meal planning with this list of 28 veggie-centric meal ideas. This resource also provides you with how to plan the key components of a vegetarian meal, key nutrients of concern and one of our favorite recipes. The regular price for the Meal Planner 6 Pack is $49 but I’m offering to you as a bonus since you are new to our email list for only $24 (Canadian dollars). Once you order this resource kit you will instantly receive our PDF download of resources to begin using immediately. YES, I’d like the 6 pack of resources please! Just like you, our dietitian team is interested in healthy eating but we never want to sacrifice taste and enjoyment. If you are like most of our clients we also know that you don't want to feel overwhelmed when it comes to trying to decide what to eat. Most of our clients are also looking for systems, tools and shortcuts that make healthy eating and meal planning faster and easier. PS You don’t need to spend hours reading a lengthy book on meal prep, the Meal Plan 6 Pack gives you a fast start with the most important things you need to know. I know you are going to love the time saving tips and ideas for meal planning. Grab this resource right now while you can enjoy this special rate. YES, I’d like to purchase the 6 pack of resources please!